Measuring 4cm by 5cm, and designed to be fun and easy to use, users can create anything from games and animations to scrolling stories at school, at home and on the go – all you need is imagination and creativity. The BBC and partners are developing a wide range of support resources for parents, teachers and group leaders. These include projects and ideas on using the device straight away, so children can get coding in minutes. There will be examples of both formal and informal learning resources. Informal learning resources will be usable outside the school environment, whether that’s at home, events or enthusiast groups or clubs. 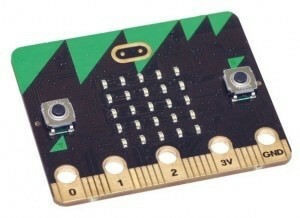 We have been informed by the Scottish Government that they are in discussion with the BBC re their MICRO:BIT launch and they are very keen that they get this right in Scotland and that all S1 pupils receive their micro:bit. They have suggested to the BBC that rather than every secondary school (362) applying separately, instead local authority representatives would apply on behave of the local authority. This would reduce the risk that some S1 pupils would not receive the micro:bit and also help co-ordinate the dispatch of the micro:bits. Susan is at a meeting on 9th September where this will be discussed, further information will be posted shortly after.